CHAD PLAUCHE-ADKINS The Marietta Times Lisa Bammerlin escorts a Washington Elementary student across the intersection of Fifth and Washington streets on Thursday. Every school day, drivers are likely to see volunteers dressed in blaze orange and carrying stop signs escorting school children across some of the busiest intersections in the city. 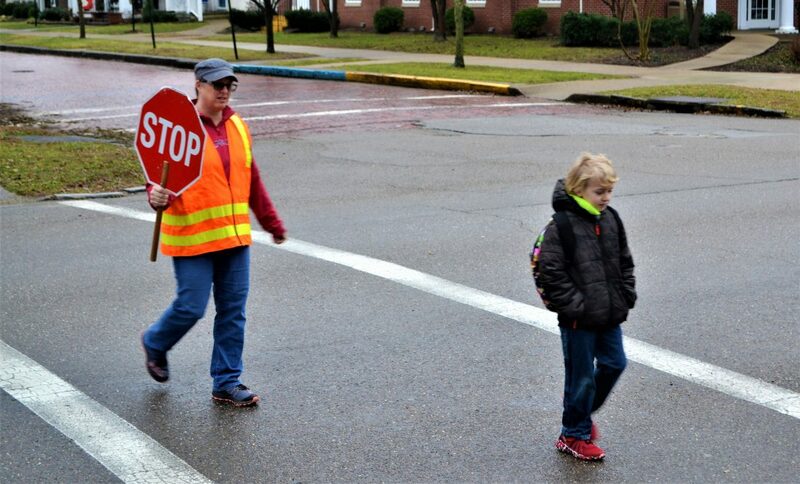 Lisa Bammerlin, 47, of Marietta, volunteers as a crossing guard at Washington Elementary and said drivers need to be more vigilant when driving near school zones. “I’m concerned that the residents aren’t paying attention,” she said. Bammerlin, one of a group of volunteer parents from the Marietta band program who work as crossing guards, said people seem to be more concerned with getting to work than observing posted speed limits and laws in school zones. She said there have been instances where that puts students and herself in jeopardy. Another problem with that particular intersection, said Bammerlin, is the antiquated street lights there. She said the lights change from red to green as soon as the other direction changes color. Bammerlin said newer lights pause a moment before changing, allowing traffic to make it through the intersection. She said she has seen many near wrecks at that intersection because of the timing of the lights. Dale Pierce, Marietta’s utility maintenance foreman, confirmed Bammerlin’s problem with the timing of the stop lights at the intersection of Washington and Fifth streets. He said the control box that runs the timing of the lights can’t be updated due to its age. “I believe the control box there is from the 1950s,” he said. He said new control boxes use electrical switches to change the lights, but the control box at Fifth and Washington uses a mechanical switch. Pierce said the age of the control box isn’t the only problem with the stop lights at that intersection. “There are no walk lights there either,” he said. Pierce said an entirely new system needs to be installed to replace the current lights in the intersection. Bammerlin said she has talked to officials about getting the project completed. “I know the city is trying to get it done,” she said. Tina Lones, office manager for the city’s Engineering Department said they are addressing the problem with the lights. “It’s still in the design stages,” she said. She said they are waiting for the design to be approved by ODOT before they can give a specific cost and completion date for the project. She did say that the city anticipated the new lights would be installed in 2020, though. Until the lights are completed, Bammerlin said there is a simple way to avoid the problems of driving around buses, speeding and not noticing crossing guards by commuters.